Ok, so to put $0. 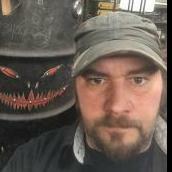 Where my mouth is on topics ofusing a sledgehammerhead as an anvil and a splitter as a hot cut, I pulled out my old sacraficial stump. This has been used from forging spoons to housing stake anvils. Ok, no excuses. I marked the pattern of a 6# sledge and drilled it out. Then hammer and chiseled then driled some more. 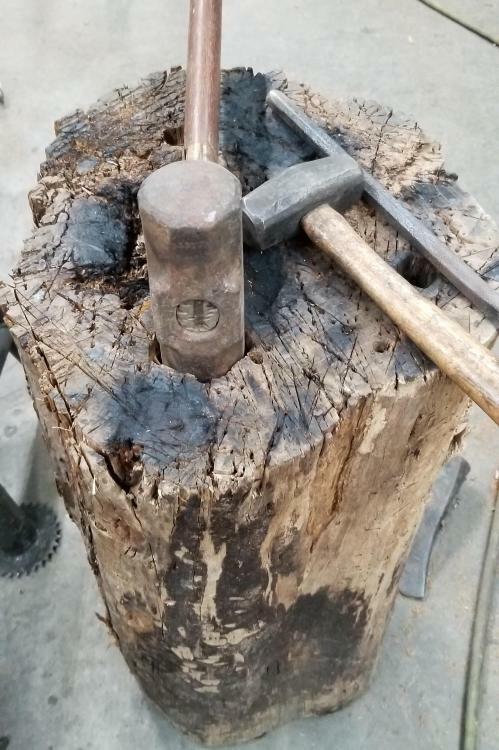 Once the sledgehammer fit i was off forhing no need to remove the handle and I was using a claw hammer to forge. Wigled out the hammer for the maul for hot cutting and ot worked great. Made an s hook and leaf for a keychain. Cool. Excellent example of good forging. Proof that even the fanciest anvil and hammer don't make you a good Blacksmith, a lesson for the younger generation. 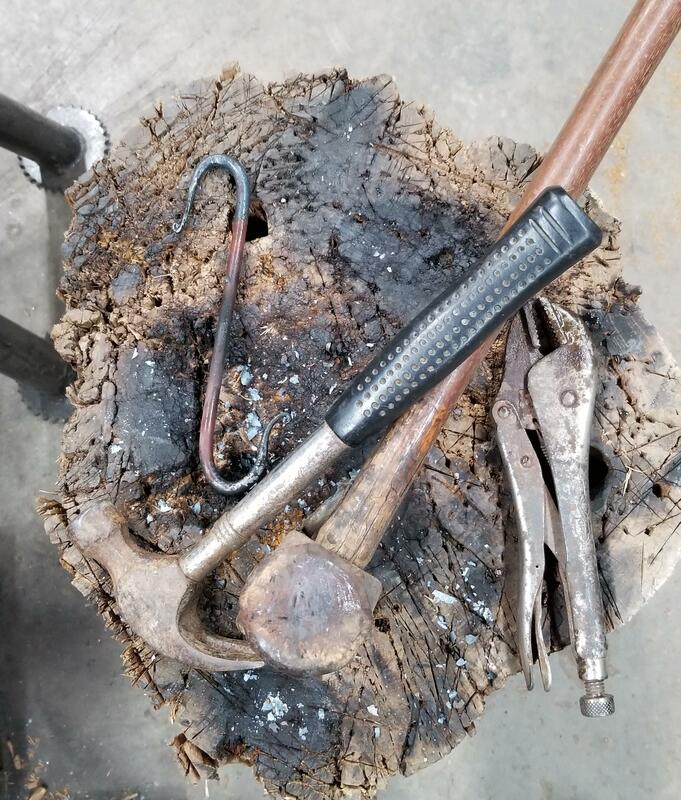 Only practice, learning (from mistakes) and a bit of talent and stubborn - ness will make you a good or bad Blacksmith or bladesmith. I keep telling folks: 1000 hours on a $100 anvil will make you a better smith than 100 hours on a $1000 anvil! I purposefully picked out a junky claw hammer to use. Despite its light weight it worked well enough on the small stuff. It's far lighter than the 2 1/2#-3# that I am more used to. It got the job done. 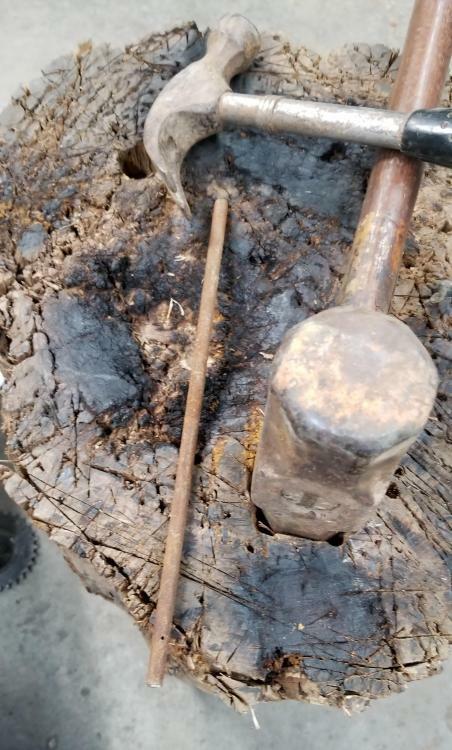 I would still recommend finding a better hammer to use since they are plentiful at fleamarkets and yard sales and even pretty inexpensive new at some stores. Your saying is entirely correct Thomas. BUY NEW????!!!!!!!!!!!!!!!!!!!!!!!! Moderator Daswulf is talking nasty again!!!!!!!!!!!!!!!!!!!!!!!!!!!!!!!!!!!!!!!!!!! Haha calm down! Geeze, some people can afford a $7. crosspeen hammer in their perusing at harbor freight. And up here the fleamarkets and yardsales are nil till spring. Some people get impatient. We don't get year round markets like you. The outdoor fleamarket I used to go to in New Jersey was year round, 20 degF and snow on the ground and folks were still getting there before dawn to get the "good deals". But I understand; some folks would rather pay more and not have to deal with *people*. Shoot down here I have to be able to bargain in Spanish to get a decent deal some places. Thanks for documenting your go at this, Daswulf. 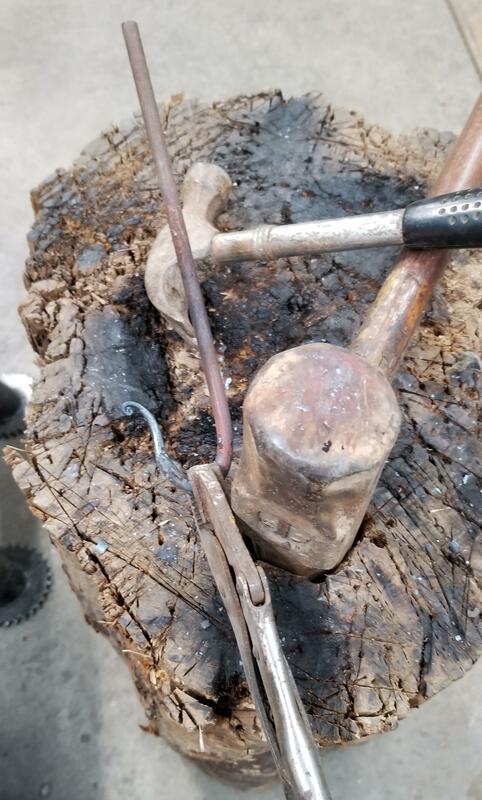 Even though I could afford more starting out, I chose to go this route to see how it works and try my hand at smithing to see if i wanted to continue. This sort of arrangement is certainly sufficient for making that assessment. Certainly gave me an appreciation for the utility of a London pattern, though. I have london pattern anvils but am wanting a german pattern anvil. Eventually... it's not like I'm in Need of it. I just said 'London' because I don't know a catch-all term for "made and sold to be an anvil, and has a horn and hardy hole"
I dream of a NIMBA; but I'm way too cheap to ever buy one... The late 19th century early 20th centuries American London pattern elongated heel and horn variants are particularly nice for ornamental iron work where as the earlier UK anvils with the much larger sweet spot are nice for heavy work! Yeah Thomas, it's hard to spend a couple grand when you have a tool that gets the job done and will continue to for a long time. On the other hand, if one wanted to they could put money in the collection each time they sell a piece made on a sledgehammer head anvil to eventually upgrade same as on a london pattern anvil, same as........ for some a sledgehammer anvil could suit their work for a lifetime. 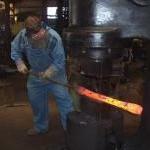 Just like the smaller block anvil that traditional samurai swords are forged on. I honestly could not do better work on a nicer bigger german pattern anvil than what I can do now. Just has features that would be a little more convenient in my opinion. Makes it hard to spend the money on one haha. I tend to blow my money going to Quad-State every couple of years. Haven't been back to Pennsic since I moved out west. On the other hand; I had the heat off and the door open today. Rich Waugh once bought a used NIMBA for half price and I was greener than the Hulk for a long long time! I think I only haven't been to Pensic because I don't understand it as an outsider. I know where it is held at, and am not far. Guy out my way bought one of those Nimba's also for about 1/2price.. He likes it well enough.. His words.. If I can ever have the money and the anvils be in stock at the same time.. Refflinghaus 58 400lbs+.. would be my choice.. When I have the money they are out of stock.. I don't have the money, they are in stock.. Eventually it will sync and it will be sitting in the trailer..
A German pattern is very handy and for doing hardware it offers about as much as one could ask for.. The flat tapered tail offers so many working options for width in a quick easy step vs having a bottom set..
Das, for sure it is not the equipment which makes a good product or a good forging.. The level of proficiency is what establishes a master, journeyman, apprentice.. As such there are tools which will make ones job easy.. But with the required skill set it will still be the top notch job.. This thought process has been my only real driving force with the forging of metal... How could they do what they used to with only hand tools. day in and day out..
Of course the processes changed as technology brought out more tooling, But, the old guys and gals who lived it, made it look easy because of how much experience they had at what they did.. I call the powerhammer "the smart apprentice" as it does exactly what you tell it to do! (Given that it's in tune!) The single person shop started appearing after the electric motor started doing a log of the grunt work. that and city life.. There was a huge transition from farm life style into city living as more people moved off the farms into the city to work at mills and factories..
while the farm would feed you in times of problems.. It was rather cash poor..
Where working at the factory on the other hand gave one cash in hand but no food, shelter, etc, etc.. I read an article on it recently and it was pretty neat how at that point wealth become transcendent verses the previous 2000 years.. of farmer, warrior, hunter, tradesman vs business tycoon..
my great grand pappy, was such a person.. He moved over from the old country worked hard, bought a farm to feed the family etc, etc.. But he also worked at the mill 3miles straight as the crow flied.. 8miles by road..